This recipe will make enough to serve 2-3 as a main dish, but don’t be alarmed if you gobble most of it up yourself, it’s that delicious! Fresh kale and purple cabbage combine with carrots, raisins or goji berries, green onion and a creamy and tangy macadamia caraway dressing. Sarahfae uses peeled and cubed zucchini to add thickness and body to the dressing without additional nuts or fats. Make this coleslaw for dinner and serve it up for lunch the next day after the flavors have marinated. 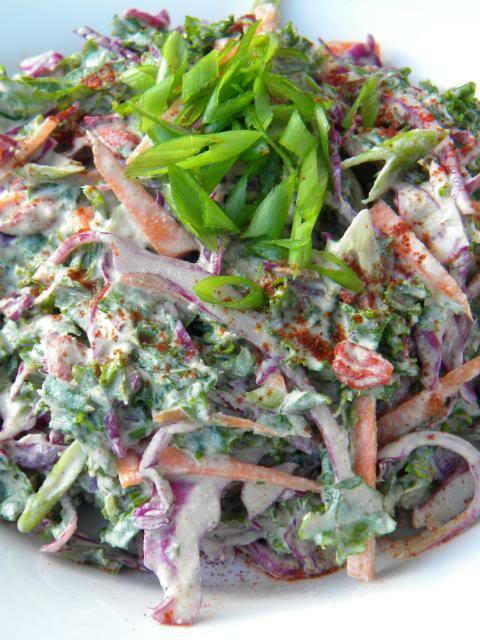 1) In a large mixing bowl combine the above “Slaw” ingredients, and toss with (optional but good): 1 tbsp lemon juice, and 1 tbs coconut nectar or liquid sweetener of your choice. 2) Add entire batch of Caraway Dressing to your Slaw and toss/mix evenly. Top your Cole Slaw with a pinch of Paprika and fresh Green Onion.